The best-studied synaptic organizing ECM molecule is agrin, which is required for formation of the vertebrate skeletal neuromuscular junction (see Chapter 1). Agrin is a large (200 kDa), complex protein that may bear two heparan sulfate chains and therefore is considered to be a heparan sulfate proteoglycan. Agrin is expressed as a secreted protein with the longer N-terminal (LN) or as a transmembrane protein with the shorter N-terminal (SN) domain. Following the SN or LN domains is a set of eight follistatin repeats related to those that bind growth factors and inhibit proteases. The central region of the protein contains two repeats homologous to domain III of laminin chains, a ninth follistatin repeat, two serine/threonine-rich segments. The C-terminal part of agrin, which is responsible for the molecule's known signaling functions, contains four EGF repeats and three so-called G domains homologous to those found in laminin a chains, neurexins, and slits. This C-terminal portion also contains three sites of alternative splicing, called in mammals as x, y, and z. Agrin activates or binds to several membrane- or matrix-associated proteins, including muscle-specific receptor tyrosine kinase, MuSK; laminin y1 chain; P1 integrins; dystrogycan; NCAM; heparan sulfates; and thrombospondins. The nerve-derived alternatively spliced z+ isoform of agrin proved to be necessary for postsynaptic differentiation of neuromuscular junction59. 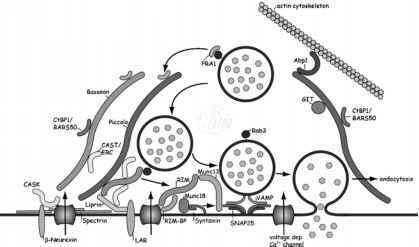 Synaptogenic function of agrin is mediated by its activation of MuSK. A crucial effector downstream of tyrosine phosphorylation activity mediated by MuSK is the cytoplasmic scaffolding protein rapsyn that induces clustering of acetylcholine receptors, thus providing one prototypic mechanism of ECM action on postsynaptic differentiation (see Chapter 1). Recent findings indicate that agrin is important for formation of synapses between cholinergic preganglionic axons and sympathetic neurons in the superior cervical ganglion60 and for formation of splanchnic nerve-chromaffin cell cholinergic synapses in rat adrenal acute slices61. In the latter, agrin decreases gap junction-mediated electrical coupling that precedes an increase in nicotinic synaptic transmission. This developmental switch from predominantly electrical to chemical communication is fully operational within 1 hour and depends on the activation of Src family-related tyrosine kinases. Also in hippocampal cultures, the density of presynaptic boutons and vesicular turnover was reduced when agrin expression or function was suppressed by antisense oligonucleotides and specific antibodies62,63. However, synaptogenesis occurred normally in primary hippocampal and cortical neurons derived from agrin-deficient mice64,65, suggesting the possibility of functional redundancy of agrin and activation of compensatory mechanisms during development in agrin-deficient cultures. Application of recombinant agrin to cultured cortical neurons induces multiple events that involve tyrosine kinase activity and result in modulation of intracellular Ca2+ levels and activity of MAPK and CaMKII, phosphorylation of CREB and induction of expression of the immediate early gene c-fos66-68. Conversely, agrin mutants show reduced c-fos expression and resistance to excitotoxicity and seizures. In summary, in several types of synaptic connections, particularly in cholinergic synapses, agrin stimulates activities of tyrosine kinases that affect important aspects of synaptic organization and signaling.